If you ask around, chances are you’d find that at least half of the people you know dreamed at one time of being a firefighter. It’s easy to see why kids are drawn to this dangerous profession when they are little. Who is braver than someone who can run into a burning building to save a cat? Who is stronger than someone who can chop down doors and wield a heavy hose? Who is kinder than someone who does everything to help others? Firemen are all of these things and it’s an admirable profession to aspire to. But just because your little one aspires to be a firefighter doesn’t mean they have to run straight to the danger – they can start out small – perhaps with a Halloween costume? When a kid suits up in this fireman uniform, he'll still be dedicated to saving lives and putting out fires, as well as playing with the fire department Dalmatian. There's really no danger too big for him after he's had his nap. This child’s fireman costume will have him out there helping others in no time! It comes with everything your child needs to live out his fantasy of being a real fireman this Halloween! This complete costume is made of 100% polyester and is a printed red shirt and pants that have all of the details of a true fireman. Also included in the fireman’s hat, because you can’t very well go into a dangerous situation without one! 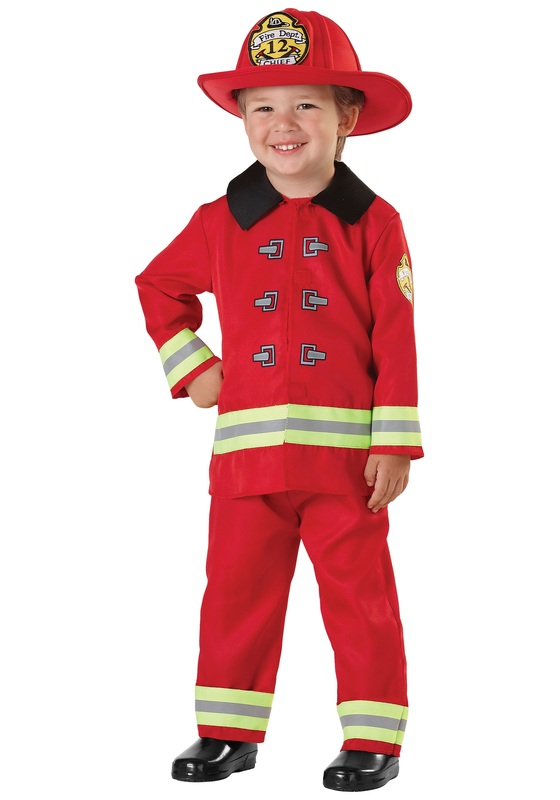 Let your little one enjoy their night out this Halloween with our fireman costume. Very cute, but very poorly made. This costume ripped at the seams the first time that my two-year-old tried it on. Customer serve was VERY helpful and sent out a second costume immediately. To be safe, we did not try that costume on until it was time for trick-or-treating. That turned out to be a good decision, because the second costume ripped a couple hours later. It is a very cute costume, but is apparently just very poorly made. However, customer service was good, so I gave it 2 stars anyway. Extremely cheap material. Ripped right along velcro within 30 min of wearing. The hat is the only decent thing cause its not plastic like most firefighter costumes so it stayed on better. Costume arrived fast and was adorable but only 10 minutes after wearing it, it came unsewn and left a large hole in the front near the velcro. I won’t be buying from here again. I ordered a xs size for my 3.5 year old and received a 12-18 month size instead. Hello! Thank you for the input. In checking your order information, it shows that when you placed the order, the size X-Small was chosen. That size X Small is in fact shown on the product page as: Child Size 12-18 MO, so that is the size we sent you. Our apologies for any confusion with the sizing. In looking further at your order information, it seems that you did not reach out to us for help with any concerns you had about the sizing of the costume. We have a great exchange program, and could have sent a replacement order for the same costume in a different size, another costume of your choice, or simply refunded the order on return. I wasn’t expecting anything super high quality but as soon as I put this on my toddler, it ripped right beside the line of Velcro that keeps the shirt closed. I suppose I could sew it... the hat was great though and he still loves to play in it. I was expecting low quality for a cheap halloween costume, but this was exceptionally cheap. The front of the jacket was completely torn down the front and totally frayed, so it wasn't even possible to sew it up. Even if I could have fixed it, I would have been unhappy with the way the outfit was put together. The collar sticks up and is stiff and uncomfortable. The only reason I gave 3 stars was because the hat was actually pretty nice.